American Board of Aesthetic Medicine (ABAM) | Step 2: Advance Course of Aesthetic Medicine is organized by MED Courses Conference LLC and will be held from Apr 21 - 23, 2019 at Dubai - ABAM International Training Center, Dubai, United Arab Emirates. CME: 18.75 CME (USA), 13.75 (DHA)​ Course Description: Graduates of The American Board of Aesthetic Medicine (ABAM)’s Step 1 program or those who already have the basic skills in aesthetic medicine can participate in our Step 2 training. Participants will increase their knowledge in aesthetic medicine and acquire the newest and most up to date aesthetic techniques. Facial contouring using botox and dermal filler, and advanced laser and light therapy procedures will enable graduates of our Step 2 to take their skills in aesthetic medicine to the next Step. Step 2 Botox training will cover procedures such as botox eyelift, scar reduction with botox, botox treatment for gummy smile. Dermal filler training will include aesthetic medical procedures such as teartrough injection, nonsurgical nasal augmention using Radiesse/ Juvederm/Restylane, cheek and facial contouring. Advanced laser training will consist of combination skin rejuvenation techniques, treatment of vascular conditions, and Photodynamic therapy (PDT). An in depth coverage of basic surgical techniques and equipments for office aesthetic procedures will be offered. Basic dermatology and teeth whitening for the medical spa setting is an integral part of our Step II Aesthetic Medicine Training program. 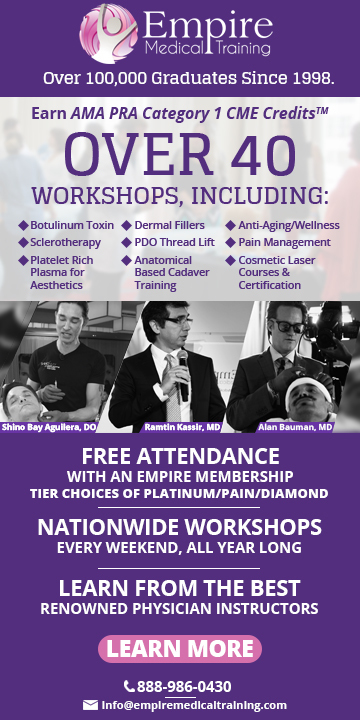 Course Outline: • Sclerotherapy • Advanced Techniques with laser & light therapy • Laser • Acne, Melasma, Minor Office Procedure • Advanced Botulinum Toxin Training • Anesthesia for Anesthetic Medicine • Facial Analysis • Review of Common Plastic Surgical Procedures • Cosmeceutical used in Aesthetic Medicine. Advanced Cardiovascular Life Support (ACLS) Certification Course is organized by Critical Care Training Center (CCTC) and will be held on Apr 21, 2019 at Critical Care Training Center, North Hollywood, California, United States of America. ACLS is designed for healthcare professionals who either direct or participate in the management of cardiopulmonary arrest and other cardiovascular emergencies. This includes but does not limit personnel in emergency response, emergency medicine, intensive care and critical care units. ACLS Course Content: • Key changes in advanced cardiovascular life support, reflecting the 2015 American Heart Association Guidelines for Cardiopulmonary Resuscitation and Emergency Cardiovascular Care • Basic life support skills, including effective chest compressions, use of a bag-mask device and use of an (AED) • Recognition and early management of respiratory and cardiac arrest • Recognition and early management of peri-arrest conditions such as symptomatic bradycardia • Airway management • Related pharmacology • Management of acute coronary syndromes (ACS) and stroke • Effective communication as a member and leader of a resuscitation team This class is for those who have never taken ACLS before or have an expired ACLS certification card. Additional details will be posted as soon as they are available. Advanced Cardiovascular Life Support (ACLS) Recertification Course is organized by Critical Care Training Center (CCTC) and will be held on Apr 21, 2019 at Critical Care Training Center, North Hollywood, California, United States of America. ACLS Recertification: ACLS is designed for healthcare professionals who either direct or participate in the management of cardiopulmonary arrest and other cardiovascular emergencies. This includes but does not limit personnel in emergency response, emergency medicine, intensive care and critical care units. ACLS Course Content: • Key changes in advanced cardiovascular life support, reflecting the 2015 American Heart Association Guidelines for Cardiopulmonary Resuscitation and Emergency Cardiovascular Care • Basic life support skills, including effective chest compressions, use of a bag-mask device and use of an (AED) • Recognition and early management of respiratory and cardiac arrest • Recognition and early management of peri-arrest conditions such as symptomatic bradycardia • Airway management • Related pharmacology • Management of acute coronary syndromes (ACS) and stroke • Effective communication as a member and leader of a resuscitation team Additional details will be posted as soon as they are available. PALS - Pediatric Advanced Life Support - Initial Course is organized by SureFire CPR and will be held on Apr 21, 2019 at SureFire CPR - Orange Office, Orange, California, United States of America. The target audience for this medical event is All healthcare professionals and medical personnel who may respond to pediatric emergencies. This class is approximately 12 hours. Course Description: • The systematic approach to Pediatric Assessment • Management of pediatric respiratory emergencies • Vascular access (Including intraosseous training) • Airway Management • PALS Pharmacology • Basic Life Support (BLS) review • Numerous pediatric case studies and simulations • How to be both a leader and a team member in a pediatric resuscitation team Additional details will be posted as soon as they are available. Asian Society of Lifestyle Medicine (ASLM) Conference 2019 is organized by Asian Society of Lifestyle Medicine (ASLM) and will be held from Apr 21- 24, 2019 at The K Hotel Seoul, Seoul, South Korea. Who Should Attend: Physicians (e.g. family practice, internists, cardiologists, oncologists, neurologists, psychiatrists, pediatrics, OBGYN, gerontologists), Dentists, Pharmacists, Nurses/Nurse Practitioners, Wellness Scientist, Health Educators, Health and Life Coaches, Psychologists, Dietitians, Nutritionists, Exercise Physiologists, Fitness Coaches, Social Workers, Massage Therapists, Physical and Occupational Therapists, Healthcare Administrators, Public Health Practitioners, Fellows in Training, Personal Trainers, Residents, and Health Lovers, Promoters, & Leaders like YOU!!! This course offers the knowledge and skills covering core competencies that were recommended and identified by a national consensus panel of representatives from leading medical and health professional organizations in the United States of America as the basis for providing quality lifestyle medicine services template. The major focus is on provision of foundational competencies for primary care physicians and allied healthcare providers to develop practical skills on clinical processes, as well as non-drug lifestyle medicine modalities: nutrition, physical activity, sleep, stress management, emotional wellbeing, substance and addiction recovery, and behavior change. The program is carefully designed for different level of profession primarily for physician, doctoral, MA, and Bachelor. Learning Objectives: The participations will be able to: • Develop appropriate abilities and skills among participants to match demand of the growing trend in lifestyle diseases and the changing health care delivery. 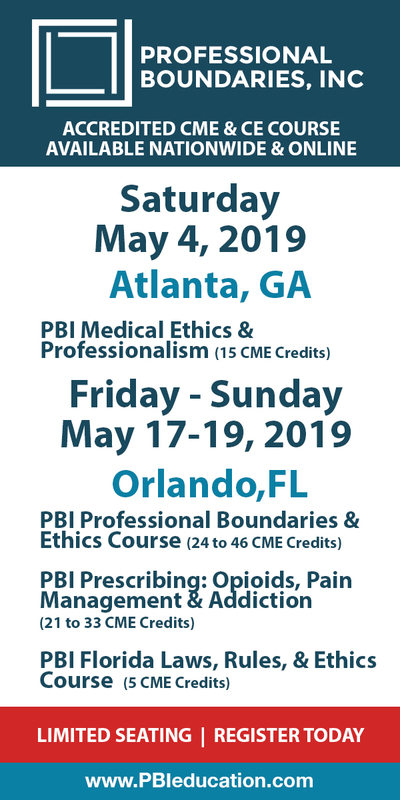 • Enhance the competence and performance-in-practice of physicians and allied healthcare professionals by utilizing evidence-based strategies incorporated to patient care, providing the newest science in lifestyle management skills. • Improve their own personal practices to serve as better role model to their patients. • Acquire Lifestyle Medicine Certificate of Competency and eventually qualify for the IBLM certification board exam. Additional details will be posted as soon as they are available. Basic Life Support (BLS) For Healthcare Providers Initial Course is organized by SureFire CPR and will be held on Apr 21, 2019 at SureFire CPR - Laguna Hills Office, Laguna Hills, California, United States of America. The target audience for this medical event is MDs, RNs, EMTs, Dentists, Pharmacists, and Medical Personnel. This class is approximately 3.5 hours. Course Description: The BLS CPR Class covers: • Adult, Child, and Infant CPR. • Conscious and Unconscious Choking for victims of all ages. • Automated External Defibrillator (AED) use and special considerations. • Breathing Barriers, Bag Valve Masks, and 2 Rescuer CPR. • Cardiopulmonary Emergencies and Special Resuscitation Situations. Additional details will be posted as soon as they are available. Basic Life Support (BLS) For Healthcare Providers Initial Course is organized by SureFire CPR and will be held on Apr 21, 2019 at SureFire CPR - Los Angeles Office, Los Angeles, California, United States of America. The target audience for this medical event is MDs, RNs, EMTs, Dentists, Pharmacists, and Medical Personnel. This class is approximately 3.5 hours. Course Description: The BLS CPR Class covers: • Adult, Child, and Infant CPR. • Conscious and Unconscious Choking for victims of all ages. • Automated External Defibrillator (AED) use and special considerations. • Breathing Barriers, Bag Valve Masks, and 2 Rescuer CPR. • Cardiopulmonary Emergencies and Special Resuscitation Situations. Additional details will be posted as soon as they are available.